Tendons are critical biomechanical units in the musculoskeletal system, the function of which is to transmit the muscular tension to mobile skeletal segments. They are extremely resistant to traction, almost like bone. A tendon with a 10 mm2 transverse section can bear a maximum of 600-1000 kg. On the other hand, tendons are not very elastic, and can only tolerate a maximum elongation of 6% before being damaged. Tendons have very slow metabolism, even during action. This can be significantly increased only by inflammatory conditions and traumas. When a reparative process occurs, a proliferation of fibrocytes is observed with deposition of collagen cells [18,19]. Tendons macroscopically appear as ribbon-like structures, with extremely variable shape and dimensions, characterized by the presence of dense fibrous tissue arranged in parallel bundles. 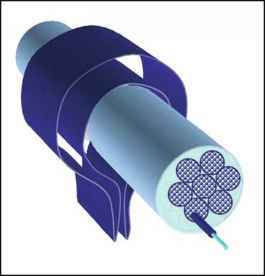 More specifically, they consist of about 70% of type I collagen fibers that form primary bundles. Among the primary bundles are fibrocytes endowed with large laminar protrusions, named teno-cytes or alar cells. Among the collagen fibers of tendons, elastic fibers (about 4%) can also be found; their role is not different from that of a "shock absorber" when muscular contraction begins. The collagen and elastic fibers both have the same direction as the main lines of force and are lying in a gel consisting of proteoglycans and water. 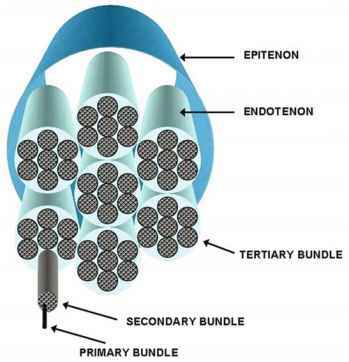 The primary bundles are assembled to form secondary bundles (representing the tendon's functional unit), which are clustered in tertiary bundles. 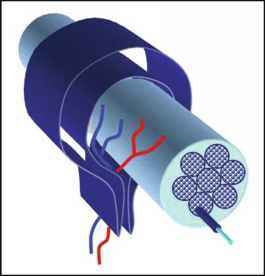 The endotenon is a thin connective strip surrounding the primary, secondary and tertiary bundles, and separating them.Vessels and nerves run within the endotenon thickness. The epitenon is a stronger connective covering, surrounding the whole tendon (Fig. 3.8) [14,20]. From a functional and anatomical point of view, tendons can be divided into two types: supporting tendons (or anchor tendons) and sliding tendons. Anchor tendons (such as the Achilles and the patellar tendon) are typically bigger and stronger than sliding tendons, they are not provided with a synovial sheath, but they are surrounded by a connective lamina external to the epitenon, called peri-tenon; the two connective sheaths (epitenon and pe-ritenon) form the paratenon together with highly vascu-larized adipose and areolar tissue . tiguous to the epitenon, and a parietal, more external, layer; the two layers come together to form a synovial "fold" named mesotenon. A closed cavity, nearly virtual, containing a very small amount of synovial fluid, is found between the two layers (Fig. 3.9) [14,19,20]. The tenosynovial sheath of sliding tendons corresponds anatomically and functionally to the peritenon of anchor tendons and, similarly, the tenosynovial sheath and the epitenon together constitute the paratenon of the sliding tendon . The vascularization varies according to the type of tendon. In sliding tendons, the vessels run within the mesotenon, the mentioned synovial "fold" which connects the parietal and visceral layers. The vessels pass therefore along the tendon's surface, where some arterioles arising from the vessels penetrate into the tendon following the course of connective laminae (Fig. 3.10). On the other hand, the vessels of the anchor tendons constitute a thick and irregular anasto-motic net within the paratenon. Arteriolar vessels arise from this net and penetrate inside the tendon to different levels, following the course of the connective laminae. The arterioles, within these connective structures, form vascular arcades with the nearby arterioles . Tendons may present with less vascularized zones, named critical areas, which are extremely important in the pathogenesis of several tendon diseases. Examples include the pre-insertional area of the supraspinatus tendon of the shoulder, or the central part of the Achilles tendon, which typically constitute highly susceptible sites of degenerative disease and tendon rupture. The points of union between the tendons and the muscle or the bone are named myotendinous junction and osteotendinous junction (enthesis), respectively. 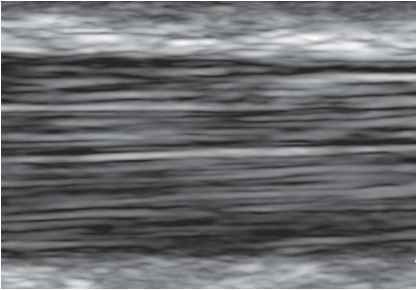 The myotendinous junction is usually well-defined: at this level the tendon fibers are intertwined with the endomysium fibers. The osteotendinous junction has a more complicated structure: its nature may be either fibrous or fibrocartilaginous according to the tendon mobility, the angle formed between the tendon fibers and the bone, and the presence of an underlying retinaculum. The tendons moving in a single spatial plan and whose insertion on the bone occurs with an acute angle (for example, the flexor tendons of the toes), have a fibrous enthesis. The same situation occurs for tendons whose course is modified and kept in position by a retinaculum - for example the peroneal tendons - and whose insertion on the bone once again forms an acute angle. The tendons controlling multiplanar movement (for example the Achilles tendon) and whose insertion on the bone surface is orthogonal, have a thick fibro-cartilaginous enthesis that minimizes the risk of tendon tear. This more complicated type of osteotendinous junction consists of four layers in quick succession, represented - from the most superficial to the deepest one - by tendinous tissue, fibrocartilage, calcified fibrocartilage and bone. The osteotendinous junction is well-vascularized and the paratenon vascular net is anastomosed with that of the periostium [14,20,21]. A retinaculum is a transversal thickening of the deep fascia attached to a bone's eminence. The biomechanical function of a retinaculum is to keep the tendons in position as they pass underneath it, in order to avoid their dislocation during muscular action. Retinacula therefore guarantee that tendons are correctly deviated and kept in position in their respective osteofibrous canals, allowing their efficient action; the synovial sheath, which always covers these types of tendons, makes the sliding of a tendon easy, and reduces friction. Retinacula are typically found in the wrist and ankle. Some examples are the transverse carpal ligament, which defines the superior aspect of the carpal tunnel, where the flexor digitorum tendons and the median nerve run, and the ankle reti-nacula, which stabilize the flexor and extensor tendons in their deflexion points . Some specific types of retinacula are found in the fingers, where the flexor digitorum tendons, wrapped in the synovial sheath, run along osteofibrous canals extending from the palm of the hand to the distal phalanx. The superior aspect of these osteofibrous canals (the "vault") consists of arch-like fibers running over the tendons, in points where more stabilization is needed. For their peculiar biomechanical function, these structures are named flexor annular pulleys. On the contrary, in regions where the canal needs to be more flexible, in order to allow the flexion of joints, a device consisting of loose plaited fibers is present, providing support to the tendon sheath without fixing it . Ligaments have an analogous structure to that of tendons; however, they are thinner and they contain a higher amount of elastin, which is a necessary element to supply these structures with some degree of elasticity for their very important biomechanical role in the stabilization of joints. There are two types of ligaments: the intrinsic capsular ligaments, which appear as localized thickenings within the capsule with a strengthening function, and the extrinsic ligaments, which are independent from the fibrous capsule and can be further classified as extracapsular and intracapsular ligaments [14,23]. (Fig. 3.11). The number and thickness of such structures change depending on the frequency of the transducer . In transversal views (short axis), tendons appear as round or oval-shaped structures, characterized by several homogeneously scattered spotty echoes (Fig. 3.12). 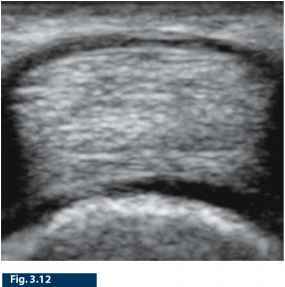 In transverse views the Achilles tendon thickness (antero-posterior diameter) can be best assessed. In transverse section the Achilles tendon is elliptical, with its major axis following an oblique antero-medial direction. The sonographer must be aware of the risk of overestimating tendon thickness when assessed on longitudinal scans [24,26]. views. When the US beam is not orthogonal to the tendon course, both a decrease of the reflected echoes and an increase of the diffracted ones occur, resulting in a significant or partial reduction of the tendon echotexture (tendon anisotropy) . This artifact is more frequently found when assessing the rotator cuff tendons of the shoulder, the quadriceps femoris, the patellar and Achilles tendons, the osteotendinous junctions, the flexor and extensor tendons of the ankle, hand and wrist. In these regions a less experienced sonographer can risk making an incorrect diagnosis (Fig. 3.13) . rounding the tendon. 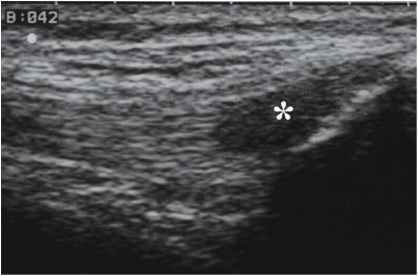 The pathological increase in synovial fluid inside the tendon sheath often allows the mesotenon to be identified. On the other hand, anchor tendons are surrounded by the peritenon, a layer of dense connective tissue leaning on the epitenon, which contributes to constitute the paratenon. The paratenon appears as an echoic line surrounding the tendon, without the possibility of distinguishing, in normal conditions, between peritenon and epitenon [26,28]. High resolution ultrasound is performed to study the inflammatory pathology of tendons in order to depict the morphological and structural variety of tendons and the synovial sheath expansion. The gray-scale ultrasound technique is still not able to recognize indirect signs of inflammation. By implementing the information obtained from a gray-scale ultrasound examination with that obtained from a power Doppler study, the sonog-rapher is able to identify functional parameters regarding the vascularization of the tendons for a better clinical evaluation. In standard conditions, tendons have low metabolic activity and the blood supply is given by high resistance arteries and small veins, too thin to be studied with the Doppler technique. In such cases, weak flow signals can be observed near small arterial structures afferent to the cortical bone. These vascular structures are usually arteries with a high resistance index, corresponding to the periosteal vessels . Several conditions such as inflammatory, post-traumatic and infectious, are responsible for the activation of vascular hyperemia with an increase in blood flow and a drop in vascular resistance. 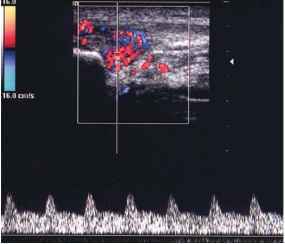 In this way the tendon vessels become easy to assess with color or power Doppler technique and it is also possible to perform a semiquantitative flow analysis of pulsed wave Doppler ultrasound spectrum (Fig. 3.14) . What is epitenon and meso tenon? How many ligaments in adnexa?